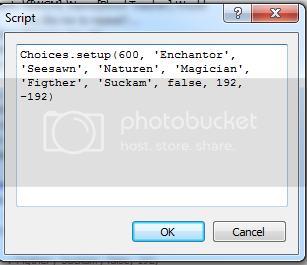 This script will allow you to set up more than the 4 choices that RPGXP limits you to. The window will behave much like the default window and is very easy to use. Does not effect the Window_Message class. # - Configuration is just below. # X, Y = The x and y that the window will be displayed at. # are the WIDTH and CHOICES array. The rest can be omitted. # - If the CANCEL? argument is not supplied, it will be true by default. # ID of variable you would like to use for choices. Should be highly compatible, even with exotic message systems. Finally, we can get more options without having to have special Custom Message Systems! Though I'll probably stick to the UMS, this is a great option for those who want to stick with other message scripts yet still want this option. Well done - great work like always. I intended for it to be used those who didn't use a custom message system, such as the UMS, but still wanted this feature. For the cancel thing, add a cancel choice index like RPGXP does. In the show choices command it says Cance Index or something. Very nice! I haven't tested it, but I'm sure it works perfectly! I can't level you up right now, since I did just level you up for that awesome comment in the Garbage Collection topic, but I'll probably do that later today. I'd prefer to use a script call in a conditional branch that returns the choice that's chosen by the player over finding the right variable and checking it then. Maybe a good (optional) future? I like this script. It'd be useful for making games like Knight of the Old Republic. There are a couple suggestions I have though. First off, it'd be nice to control the height of the window. You'd still be able to have as many options as you want (since window_selectable scrolls if the contents are too big for the window), but it'd look prettier. (you could have 20 options, but only show 4 in the window at a time). You should allow the default values for width, height x, and y to be configurable in the configuration section. That'd make it so we don't have to set X, Y, width, or height unless we want it different than the default. It'd make the script more snazzy. All you have to do is not set a condition for the option you want to be the "cancel". It will not do anything and have the exact same effect. For example, say you have 2 options (yes and no), only set a condition for "yes" if you want it to be a cancel if the player selects "no". Thats why there is no "Cancel Option". I don't think that's what Game_Guy was getting at. With the event command, you can have a different branch for when you press the Cancel button, which is different from each of the choices. So, with the event command, you could have the choices "Cow", "Sheep", and "Albatross" show up on the screen, but when you press Escape, it acts as a fourth choice that isn't visible to the player. I'm not positive, but I think that's what G_G was referring to. Anyways, this looks like a great script, and I'm going to use it in the game I'm working on right now. Produce certain choices only if an item is in inventory? If a switch/variable is active? I want to use this script for making a 'music box' of sorts. Choices will only appear if say the player has a "CD_Battle Theme" item or "CD_Overworld Theme" item. If not this script, anyone have any ideas how I could go about this without excessive conditional branching? Could do this. Call this in an event first of all. Then have a parallel process check if player has an item. If so add the choice to songs. Something like this. Then just call the window like you would normally except use $songs as the choices. I was really excited to find this... I spent several hours looking for a script like this. I want to have choices only show up in certain situations, like jragyn00 and game_guy were talking about. So, thanks for making it, and thanks to game_guy for showing the basics of how to use the script that way. I have had a lot of fun pushing this script to its limits. First, this script isn't 100% compatible with the Multiple Message Windows (non-SDK) script (by Wachunga & revised by ForeverZer0). Whenever I use this choice script as the last text window of an event, pressing the action button or Back/Esc/X button not only registers the choice, but it also performs whatever function it would perform if the choice was not present. So, if I exit your choice script menu using Esc, it also brings up the menu, and if I choose a choice with the action button, then I also reactivate the event. Again, this only happens when using both this script and the Multiple Message Windows (MMW), and when the choice is the last text window of the event. Also, the bug does not occur with RMXP's native Show Choices command. Second, would it be possible to get this choice script window to show up as a speech bubble, like the MMW script's default? Third, if all of your choice options are conditional on switches or variables, it is possible that your Choices array will be empty, which crashes the game. Currently, I program a check for this into my events. However, it might make this script better to check for an empty array automatically. Finally, just in case anyone else is interested in how to have choices that only show up under certain conditions, here's how I've done it--there are several complications beyond what game_guy showed above. All of this is event processing/scripting. It's written for somebody who knows as little about scripting as I did a few days ago--all I knew was what variables, switches, and strings are. Now, the only thing I don't know is which variables/objects/arrays to use to discover if an item is in the inventory/equipped or what a character's current stats are. EDIT: Note that, unlike $game_switches, $game_self_switches contains its data in double brackets []. 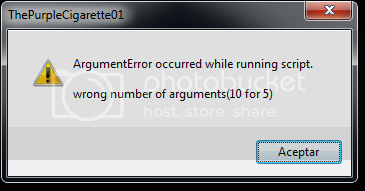 I learned this the hard way--you'll get a "Wrong number of arguments" error if you use single brackets. You can use a similar process to check for items in the inventory, character stats, etc. I haven't figured out how to do any of that yet, but all of the information is stored in a number of variables, arrays, and objects. (An array is basically a list of numbers or "strings" of words; an object is a complex combination of variables that are connected to one thing--like one party member's stats, armor, name, and ID number.) Use Conditional Branches or $game_variables[variable number] to check the variables that events usually access. The first number--width--is in pixels, I believe. Experiment around 200 to get a feel for it. Now, if you try to run the event, but all of your switches are off, then your array may be completely empty! This will crash the game. So, go right before the Choices.setup script, and enter in a Conditional Branch using $YourArrayHere.empty? == true to prevent this crash. You can either set it to "Exit Event Processing" or "Jump to Label" to jump to a different place in your event. Either way, it needs to skip the Choices.setup script. Ideally, it should skip the check-what-the-player-chose scripts ahead, also, or a choice from a previous event might make something weird happen. @>Conditional Branch: Script: $IanSchoolPeople[$chosen] == "Ask About Bartholomew"
@> : his classes, does he? The purpose here is to go backwards and use the choice number to generate the actual Choice the player picked, which we can use as a condition no matter what switches happen to be on or off. Creating a new variable (in this case, $chosen) is necessary because the first choice in $game_variables is 1, but the first choice listed in $IanSchoolPeople is string 0, $IanSchoolPeople. If your condition was $IanSchoolPeople[$game_variables], then you would always be one choice off from what you wanted. I don't think I explained that very clearly, but the code works just fine. Another note: So far as I can tell, the script simply ignores all nil choices. So, even if your array is "Choice A", "Choice B", nil, "Choice D", Choice D will still register as #3, and you will need the technique above to process the choice's consequences. If any of you more experienced coders see a better way to do the same process, feel free to post. If any of my fellow-newbies have questions, feel free to ask me. Or someone more experienced. Of course, Zer0, if you have a more efficient/alternative method to make this script work like he is talking about, by all means, share. I suppose I could redo the script real fast. It was originally just something I did for a specific need, then felt with a minor edit or two I could release it. I didn't really put a lot into it at the time, but it won't be hard to improve it. I may even throw in a couple new features, who knows. Of course, it seems like most your scripts were developed to accomplish a purpose of your own, haha. What other scripts have you developed but not released... yet? Probably a whole bunch. I used to write scripts left and right, some useful, some not. I only released anything that could be compatible with other scripts, or that I thought were worthy. Many of them, although they are "scripts", are quite worthless unless used for a single specific purpose. A good example would be the little intro you may see in some of my demos where the letters all come together from off-screen. It may be cool, but what else would you ever use that for? inbattlecutscenes, advertisements(story-game-related), puzzles (see half the letters and guess what it says? idk, creativity beckons that) or... well, I dunno. The choices are not in an array. Simply add a [ before the first choice and a ] after the last choice (before the comma). I know this script is old by now, but I wanted to point something out, since I'm currently using it in my game. I made a demo event that triggers with the action button. When selecting a choice, it's supposed to start a track, and then the event ends automatically. I select the choice, the track plays, and the event ends like it should. But when selecting the choice, since the action button was pressed to select it, the event triggers again. Thus meaning the action button reads on the map even after the choice window is closed. I'm not sure if that's only my game doing it or not, but it may become a bit of an inconvenience for some others. What I'm doing is setting it to go to another event page with an action button trigger after selecting the choice, which makes it go back to the original page. Thus the trigger doesn't restart the event. So it's not much of a problem to me, personally, since I can get around it. I'm thinking the reason no one pointed this out before is because they had commands go on after the choice is selected, which would negate the press of the action button, and so nothing happens to them. But for events that close right after the selection, it'll be an issue.